It was clear that Holy Cross' 32-0 loss to Yale wasn't going to yield many highlights for their end-of-the-year DVD. At 2-5, the Crusaders did, and still do, have a chance to win the Patriot League, if they win the rest of their games and Lafayette loses twice - certainly not an inconceivable notion. Even so, Holy Cross athletic director Nathan Pine sent shockwaves through the Patriot League this weekend when he called head coach Tom Gilmore and told him that he was being terminated immediately, with Brian Rock, the team's offensive coordinator and quarterbacks coach, taking over in an interim basis. The fall of this Holy Cross team and the circumstances that led to Gilmore's firing was stunning. It's not particularly close: Holy Cross possesses the best out-of-conference results in all of the Patriot League this season. They started out the season on August 31st and put the fear of the afterlife into all of the UConn fans present at Rentschler Field, carrying a lead well into the second half before wearing down late and honorably falling the the Huskies, 27-20. The following week, they thoroughly dominated Bucknell 20-0, gaining their first Patriot League conference victory, and followed that up with a win over the No. 9 team in the nation, New Hampshire, that wasn't nearly as close as the 51-36 win might lead you to believe. Back in week three, when I was weeding my garden to help me work through the frustrations of Lehigh's 0-3 start, I looked up at Woo and was impressed. "I'd be lying if I said that, at this early time, Lehigh looks like a team that will win the Patriot League," I said. " Not after a week where Holy Cross put up 51 on New Hampshire and made their 'challenging' game against the Wildcats into a shocking laugher. Right now, out of the gate, Holy Cross looks like they might have what it takes to win the trophy." Since I typed those words, Holy Cross hasn't won another game and has fired their head football coach. It started with an agonizing loss to Dartmouth that pretty much defies any rational explanation. After QB Peter Pujals rallied to tie the football game at 20 with 3 seconds left, all the Crusaders needed was an extra point to win the game - and it was blocked. In overtime, Dartmouth scored a touchdown and an extra point. When RB Diquan Walker scored on a 1 yard run, Gilmore decided to go for 2 and the win... and they didn't get it. Then came a heart-wrenching loss to Lafayette, 10-7, when, tied at 7, Gilmore decided to go for it in his own territory, 4th and 1 on his own 33 - and the Crusaders could not get one yard to move the sticks. Lafayette would move the ball 5 yards, line up for a 43 yard field goal - and win the game. Those two losses led to two more losses, to teams that Lehigh are very familiar with - Monmouth and Yale. 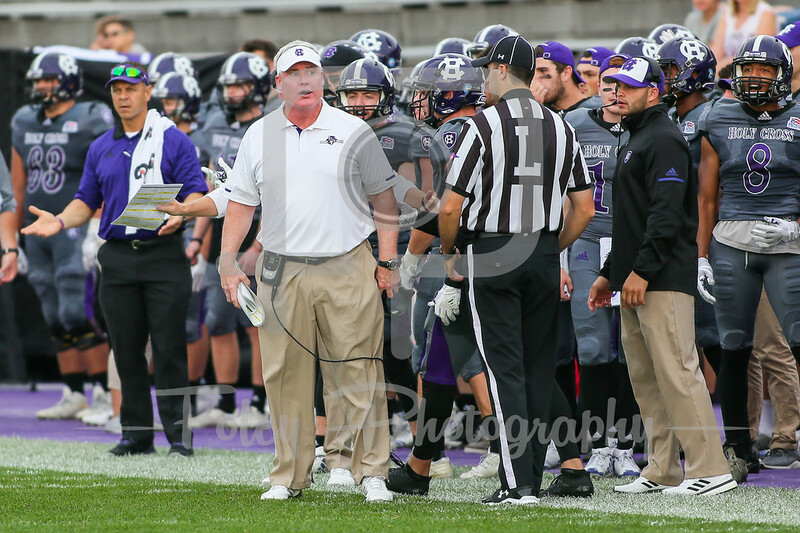 The Crusaders lost a shootout to the Hawks, 48-36, and were completely grounded on offense in a 32-0 loss to Yale - and just like that, Holy Cross' fourteen-year head coach was terminated. It's hard to fully grasp the stunning rise and fall of the Crusaders, and yet, it's important to realize that the final chapter of their season hasn't been written yet. If this football team manages to emerge from this disruption to win four straight games, it will be an amazing story. What makes Nathan Pine's decision to terminate Gilmore so difficult to grasp is that the Patriot League Championship is still so wide-open. Bucknell, with a 3-3 record, is the only Patriot League team that currently does not have a losing overall record in FCS play. However, their one loss is in conference to, of all teams, Holy Cross. Lehigh and Lafayette are 2-5 -- and are 2-0 in the conference. Colgate, at 3-4, is right on their heels, with 2-5 Holy Cross right next to them - and the Raiders and Crusaders play this week in what essentially is a playoff game. The winner will remain alive in the Patriot League hunt - and the loser will probably need to think about rebuilding, with two conference losses. I've attended a number of post-game pressers with coach Gilmore over the years, some very happy for him and his Crusaders - a 59-10 shellacking of Lehigh in 2007 - and some that were the tough defeats, like a 24-21 loss to Fordham that same year in the Bronx. Each time I talked with him he was always a pleasure to deal with, win or lose. 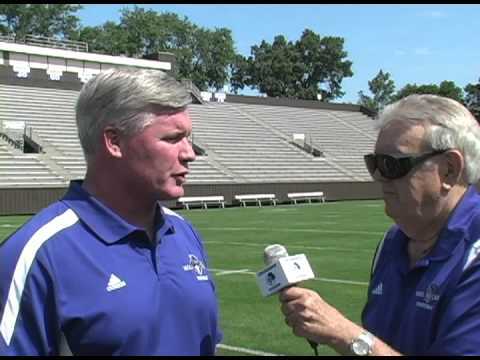 In 20017, Gilmore, who was hired away from Lehigh to become Holy Cross' head coach, had every right in the press conference after their 59-10 blowout with over Lehigh to do a few victory laps and stick his finger in the eye of the Mountain Hawks after the win. His very memorable, exact quote was that he "fully expects Lehigh to rebound and learn something from this, just like we would. It's a tough pill for them to swallow, but I know what the people here at Lehigh are all about, and I know they are going to respond in a positive way." That's a type of class that will be difficult to replace.